Spiral nozzles produce either a spiral full cone or hollow cone spray pattern, the spiral full cone pattern is developed from a series of concentric hollow cones which combine to give a full cone effect. The liquid is atomised into small droplets by a continuously descending spiral, therefore enters and exits with no internal restrictions through the nozzle. The result is a higher discharge velocity so low pumping pressures can be used to produce the required atomisation. We offer a wide range of flow rates and pressures with spray angles available from 60° to 180°. 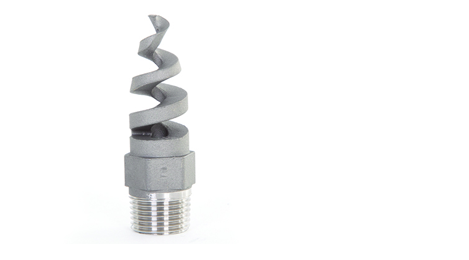 All spiral nozzles benefit from an unobstructed flow passage thus minimising clogging potential. Evaluate your specific spray application and implement a regular nozzle maintenance plan. Monitor flow rate and pressure to detect wear, loss of pressure and /or increase in flow confirms nozzle wear. Use strainers to reduce nozzle clogging and ensure optimal performance. Visual inspection of spiral nozzles confirms that nozzle wear destroys spray pattern uniformity. Streaks develop and the pattern becomes heavy or light in sections. 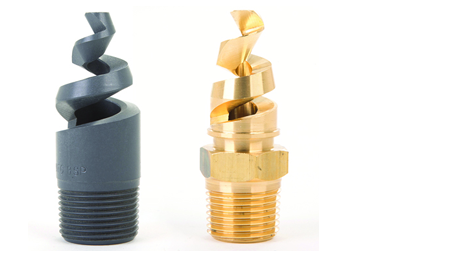 Spiral type hollow cone nozzles produce droplets that are slightly coarser than other hollow cone nozzles, this type of nozzle offers high flow rates in a compact size.